UTG Answers - How close is the Ebola outbreak area to East Africa or Southern Africa? How close is the Ebola outbreak area to East Africa or Southern Africa? 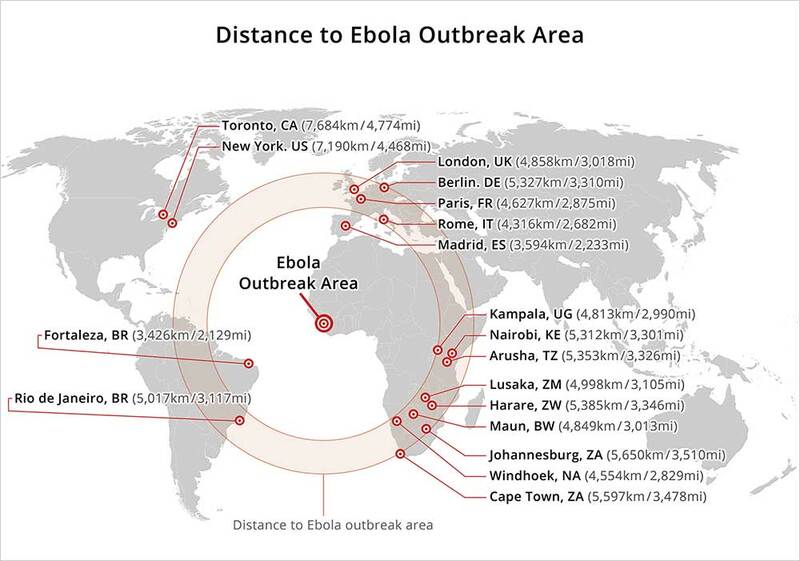 The distance between the Ebola outbreak area to countries like Kenya, Tanzania, South Africa, Botswana, etc. is more than 3,300 miles. In fact, New York is closer to Los Angeles than Monrovia, Liberia is to Nairobi, Kenya. The map below provides a good overview on how far your safari destination is from the outbreak. I'm worried about getting Ebola on safari. What precautions against Ebola have been enacted? Are children allowed on safari?